This Valentine’s Day is going to be a little less sweet. SweetHearts, the colorful, heart-shaped candies with sugary messages like “Kiss Me” and “My Love” will be scarce this year. If you’re lucky enough to find them, they’ll be from last year’s batch. It’s kind of a historic moment. These candies have been a mainstay of Valentine’s Day since 1866. The candies are so entwined with this special day that they ranked as the No. 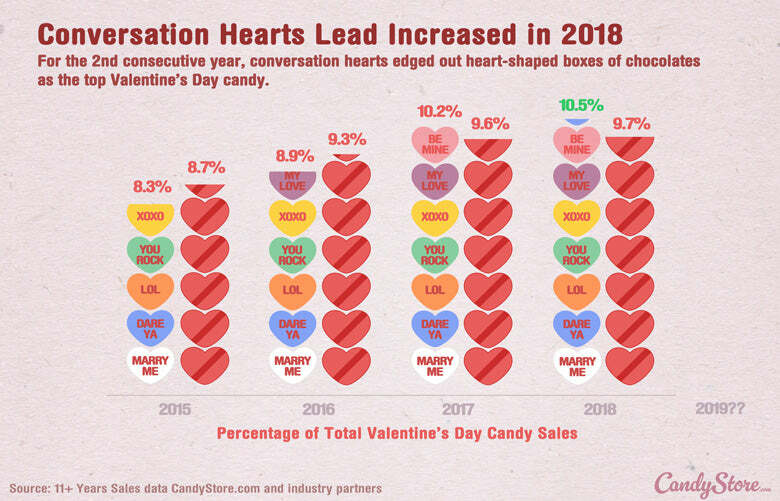 1 candy for Valentine’s Day in 2017 and 2018, according to data from CandyStore.com, an online bulk candy store. The candies may not be going away forever. But the reason they’re not around this yearhas to do with the demise ofAmerica’s beloved New England Confectionery Co. Comments for Be Mine? Nope. SweetHeart Candies Hard To Find This Valentine’s Day are now closed.